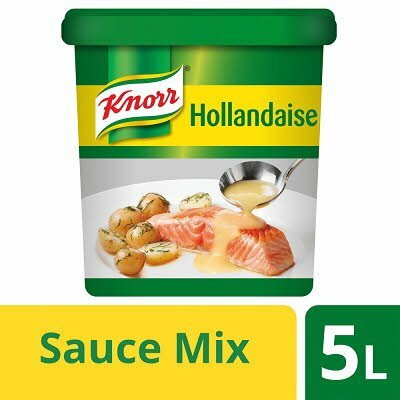 A classic sauce mix which makes a buttery Hollandaise sauce. Maltodextrin, modified corn starch, palm fat, salt, yeast extract, lactose (MILK), sugar, dried EGG yolk (1.5%), MILK proteins, thickener (guar gum), onion powder, lemon juice powder, flavourings, acidity regulators (sodium acetates, calcium lactate), spices (turmeric , parsley roots), acids (citric acid, lactic acid), caramel syrup. May contain gluten, celery and mustard. Stir 150g of sauce mix into 800ml of cold water and bring to the boil while stirring. Melt in 200g of butter and stir. Store in a cool dry place, until best before end date.